Hannah Moles was raised in a bite-sized town of Nicholasville, Kentucky where she grew tall with artistic influences close to her. She spent many of her hours in an art studio buried in Wilmore, Kentucky. She was then smacked upside the head with the fine arts community as she was admitted to the University of Kentucky in 2013. After acceptance into the BFA program Hannah created work, attained knowledge, and achieved her degree in December of 2017. She produces work through fibers, paint, and installation sculpture. She is presently producing work on commission, and constructing a new body of sculpture work. Through her work Hannah explores tenderness and how identity is refined and strengthened through our human connections. Currently I’m exploring a new space, a new practice, but old and archived sentiments. I’m striving to interpret my hollow yearn for past connections as I compose new work. I get caught in pangs of longing for past lovers and outgrown friendships. I’m chewing on tough meat; leather even. The sculptures I’m making represent what’s expired, left over, and preserved of these people, places, and eras from my life. They emulate shells that are now abandoned, with varying levels of life still pulsing through. The practice of making these figures is a meditation to sort out why I still hold space for them. I think the very best stuff has wriggled towards me, by acting large and loud in a way that my gut knows true. There’s certainly a learning curve there, but courage is a quality I couldn’t trade for anything. I’ve learned to dance with logic and reason, but I keep my deep yearns at the front of the line. So I dive into my creative pursuit as a remedy to a belly ache. Because my gut finds art and creation as a solace. There was an instance in undergrad that I faced a sharp corner- would I continue following a route of education, would I be a teacher? But in the pit of my stomach I recognized that wasn’t where I was supposed to be then. So I turned on my head and began pursuing visual art with abandon! I believe its all more intricate and multi-dimensional than a short and sweet fragment of advice. For it to actually hold influence, I’ve found that its a repetitious exercise that I have to restate every time I walk into the studio. I think what I hold onto the tightest today, is to act in bravery and endurance. My practice juggles quite vulnerable things, and the act of making itself is a vulnerable thing. It is pertinent to remind myself of my worth and purpose in the artist’s forum. So I follow the advice to make, and then make some more. We are so capable of proficient and poor work. We will all make poor work. But its until I proceed to make it- flush it out and turn it physical- that I can get over it and move forward in the studio and my head. I’d like to throw myself back in the woodshop! I worked within a realm of loud noises and power tools in undergrad, but when my artistic direction wasn’t yet defined. My work has adapted qualities that are very tender, sometimes fragile, and generally soft. I’d be so interested to see my practice unroll in the unbending environment of woodworking. I do hope that it would remain very tender and sometimes soft. I’ve found my most promising route to sell and freelance, is to simply show up. Of course a reputable website, business cards, and the works will prompt a follow-through. But to root into a community- attend gallery openings, engage in conversation, volunteering yourself and your time- has proven the most genuine networking method for me. In what season do you plan to follow me? I’m a sunbird, and I really gravitate to the heat and rays. So I think my place here in MN is a very funny thing! But- given a radiant day- I would probably take you on a bike ride! And we would listen to all the right music and blind ourselves by the sun, and it might make us cry. We would pit stop for coffee at Five Watt Coffee Co, and continue to breeze around Lake Bde Maka Ska. We might nap and roast in the sun. Hopefully you remembered your book, because we love reading. Then we would uproot, snag a six pack of Hamm’s at Hum’s Liquor, and go cook dinner at my house! For inquiries related to Hannah’s work, email hmoles@ymail.com and follow Hannah on Instagram at @honeyslider_ . Ae seeks to exhibit short-form experimental film and video art at a length 12 minutes or shorter for our sixth annual Film Festival. The deadline for submissions is May 31. Learn more and submit your entry on our Film Freeway page. Feel free to email if you have any questions about the submission process by sending a message to aefilmfest@gmail.com. We are also seeking donations to support this event. 100% of your tax-deductible gift to Ae goes directly to the festival’s operating costs and paying participating artists. Interview written by Sarah Kuenzler, edited by Sarah Kass. 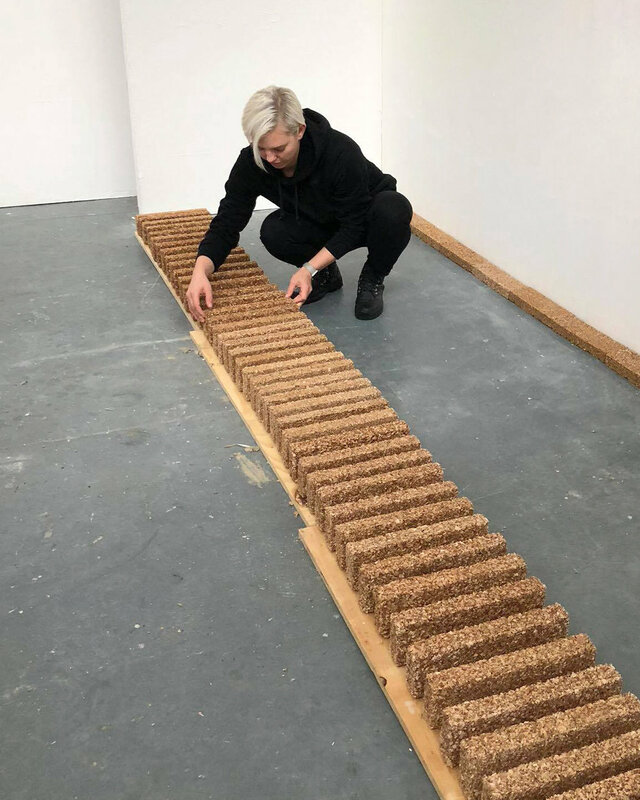 Emily Swanberg is a Minneapolis, MN based sculptor whose work is influenced by the environments, materials, and processes inherent in architecture and systematic design. In 2016, she earned her Bachelor of Arts in Psychology and Bachelor of Fine Arts in Studio Art from Bethel University. Her work has been included in various exhibitions, including the 2018 Masters Show at Duncan of Jordanstone College of Art and Design in Dundee, Scotland. Swanberg is currently an MFA candidate at the University of Minnesota. My work examines the ways sites are marked, unmarked, and distinguished from surrounding areas. With emphasis on both the planned meticulousness and the precarious jury-rigging of the construction process, the sculptures observe and absorb the tendencies of built architectural and utilitarian structures. The materials of these structures exist as relics of a place, witnessing the complete action timeline of the site. I am interested in the shift that occurs when those materials are translated and re-materialized in a new context under new pretenses. In this translation, I aim to investigate what it means to mark a site with a structure and how the physicality of structure functions beyond what it marks. Employing altered building processes and re-fabricated materials, my work fetishizes and dissects the intimacy of building labor and the ways it links to systems of power and authority. The objects forcedly slow down and frustrate the building process, questioning how constructive labor functions within larger society. My previous work was also very materials focused, considering ideas of national power and identity. But my current practice feels much more intimate. I tend to and care for my materials in a way that feels almost sentimental in nature. Ideas and relationships are much subtler, softer. My hand and my labor have become infinitely more important than they have been in the past. A process which I’ve noticed in your recent work is the use of casting. Can you talk a bit about cast objects and repetition and how those elements inform your new work? I think I initially fell into casting because of how demanding and process heavy it is. My work has become focused on labor lately-- considering systems of building labor as well as my own labor. It therefore feels important that the objects I create demonstrate the labor that I put into them. I like the way that casting requires so much behind-the-scenes work and that it can capture that effort in a really tactile way, even when the final object presents as fairly pristine. For my current project, casting has held even more weight because it has allowed me to dissect and reform even the most basic building units. Namely, I've been packing sawdust into 8-foot long molds to mold back into lumber again. After literally breaking down the wood into its messiest form, using a mold allows me to put it back together with my own hands. The resulting lumber holds the same material as the original but has structurally become something completely different. For this project that is so rooted in dissecting systems of assembly, it made sense for me to disassemble and reassemble in this way as much as I could. Material choice also seems to play a large role within your practice. How does the filtering of material effect your palette [color, texture, etc]? I tend to use pretty traditional building materials-- lumber, concrete, drywall, insulation, etc. Everything is naturally pretty pale, sometimes warmer in tone, if not completely neutral. My palette tends to be a bit calmer, softer when I leave those raw materials exposed. I appreciate when these traditionally very strong and structural materials feel more intimate and accessible in that way. I also like things to feel touched or touchable. Making objects feel visually tactile opens up the material for a person as well. I don’t remember ever deciding to become an artist. My father has been gifting me tool sets ever since I was 5 years old. As my collection grew, I eventually got to a point where using those tools felt like the only thing to do. Over time, working has become increasingly central to my everyday life. So I guess I’m an artist now. My undergrad mentor, Ken Steinbach, once told me to learn the proper way to use a new material and then to completely ignore it. I’ve learned that knowing the way materials are prescriptively used offers a great deal of insight into how that material holds and persists. But for me, pushing it beyond those prescriptions to a place that feels more true to a concept or structure always leads to a better result. I’m constantly referring back to that advice, trusting that I’m allowed to do whatever I want. I did a bit of printmaking in undergrad but really only scratched the surface of what’s possible with that medium. I’d like to try using printmaking methods to create 2-dimensional prints from 3- dimensional objects. I think there’s a lot of opportunity there to experiment with and portray objects in another way. There are so many excellent artist in the Twin Cities. Some of my current favorites are Eric William Carroll (http://www.ericwilliamcarroll.com/), Brittany Kieler (http://www.brittanykieler.com/), and Emmett Ramstad (http://www.emmettramstad.com/). Because my studio is in the UMN Regis Center for Art, I frequent the University of Minnesota galleries most often. Working at the Katherine E. Nash gallery offers me an insider look at the larger exhibitions alongside briefer shows and student pop-ups. Off campus, I like visiting smaller Minneapolis venues like Yeah Maybe, Hair + Nails, and Q.arma, which offer a more casual setting for checking out new and experimental work. Mia and the Walker are Minneapolis must-sees, of course, when in a formal art-viewing mood. The vast majority of my time is currently dedicated to preparing for my cohort’s graduate thesis show. The House | The Yard will be on view at the University of Minnesota’s Katherine E. Nash Gallery in the Regis Center for Art from April 9 -27, 2019. There will be a public program and reception on Saturday, April 13 from 5:30 – 9:00 pm. For more of Emily’s work, check out http://emilyswanberg.com/. Follow Emily on Instagram at @emily.swanberg and Twitter at @easwanberg. with a public program and reception on Saturday, April 13 from 5:30 - 9:00 pm. Our sixth annual Film Festival is open for submissions! Learn more and submit your entry on our Film Freeway page. We are also seeking donations to support this event. 100% of your tax-deductible gift to Ae goes directly to the festival’s operating costs and paying participating artists. Interview written by Donny Gettinger and edited by Sarah Kass. NCECA (The National Council on Education for the Ceramic Arts) is hosting it’s 53rd annual conference in Minneapolis from March 27 - 30. Check out these tips from local ceramic artists on where to find their work and other great exhibitions during Claytopia 2019. Katayoun Amjadi is currently a Teaching Assistant and MFA candidate at the U of M. Previously, she was an Assistant to the Gallery Director at the Circa Gallery and Curatorial Intern for the Department of Contemporary Art in Minneapolis Institute of Art. Her work has been exhibited in several group and solo exhibitions nationally and internationally, including Minnesota Museum of American Arts, Rochester Art Center, Instinct Art Gallery, Weisman Art Museum, Soap Factory, Beijing Film Academy and 7Samar Gallery in Tehran. Amjadi received her BFA in Studio Arts from the University of Minnesota in 2013. She is also a 2015 recipient of an Artist Initiative Grant from the Minnesota State Arts Board. She was born in Tehran, Iran and resides in Minneapolis, Minnesota and maintains a studio in the Q.arma building in the NE Art District. Is there anywhere we can see your work on display during NCECA? My works are up at the Hair&Nails Gallery, Quarter Gallery at the University of Minnesota, and some decorative works are at Gallery 360. Any additional exhibitions you’d like people to know about? I also organized a show at the Q.arma Building with mostly ceramics installation artists. Jason Kittel is an artist who lives and works in Northeast Minneapolis. His primary focus is on the current social situation and one's experience within. These questions and ideas are addressed through sculpture and performance. Jason Kittel is also a co-founder of Truckstop Gallery located on Niccolet Island near downtown Minneapolis. What are you looking forward to seeing during Claytopia this year? Truckstop is hosting two Canadian artists; Magdolene Dykstra and Janet Macpherson. This collaborative installation explores an environment pushed too far; hybrid animals scattered within an uncompromising landscape. The unfired installation is sure to stand out among the gallery shows and this year’s NCECA. More details and information can be found at www.truckstop.gallery. Ernest Miller is a ceramic artist working in Minneapolis, MN. He can be found at local art centers sharing ceramic techniques and experience through teaching classes at Fired Up Studios in Golden Valley, MN and the Minnetonka Center for the Arts in Wayzata, MN. His ceramics career has been mostly built through showing work in various regional and national art fairs including the Uptown Art Fair in Minneapolis and the Smithsonian Craft Show in Washington, DC. You can find a selection of his work at The Grand Hand Gallery in St. Paul, MN and Schaller Gallery in Saint Joseph, MI. Miller credits a formal education as foundation for a successful outlook on ceramics and the arts. He received an associates degree from Olney Central College in Olney, IL and a Bachelor of Arts degree from Eastern Illinois University in Charleston, IL. Where can we find your work during NCECA? For NCECA my work can be found at "Pot Spot" and the Northern Clay Center pop up gallery at the convention center. Are there any exhibitions you’d suggest to people visit while in town for the conference? There's a few exhibits in particular I recommend seeing. An exhibition of Don Reitze, Chris Gusting, Warren Makenzie, and John Reeve at the Minnetonka Center for the Arts is amazing. Liz Pechacek is a Minneapolis based ceramics artist whose work is primarily concerned with the making of beautiful objects. I am also sitting on a panel about ceramics business at the convention Center Thursday at 3:45 and giving a gallery talk at the Northern Clay Center expo hall booth Wednesday at 3. I am really looking forward to the show at Veronica Wantz and the Russian Art Museum. Interviews written by Donny Gettinger, edited by Sarah Kass.